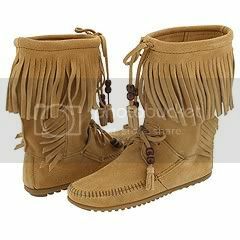 The Minnetonka women's Woodstock Boot is based on a classic moccasin style, with a bit of "funky" mixed in. There are beads and fringe and... well, you get the picture. Colors: These boots are available in Black, Brown, Dusty Brown and Tan (shown in left photo). I love those boots! They are perfect! I get a lot of compliments about them. They are very comfortable, like slippers! I was kind of nervous before I get them, because of if they would not fit, or whatever. But they are absolutely perfect... Click here for multiple reviews for this boot.